Go GREEN with the MF this April. As membership coordinator here at the MF, I'm extremely proud about the fact that last April we became the first museum in the United States to offer a GREEN Membership level. With absolutely no paper involved, GREEN members choose to forgo ALL printed materials. In addition to being a responsible environmental choice, this allows a larger portion of their membership contributions to go directly toward the art, rather than slick exhibition announcements or fundraising correspondence. But what's cooler, I believe, than being the first museum in the US to offer a paperless membership, are the everyday green efforts that occur here at the museum. The dedication of the entire staff to operate efficiently, yet eco-consciously, amazes me on a daily basis. 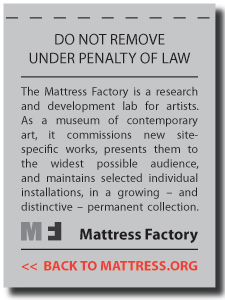 So throughout the month of April (in honor of Earth Day on the 22nd), I'll be showcasing some of the ways the Mattress Factory chooses to incorporate environmentally-conscious procedures, projects and people into its daily operations. From recycling and retro-fitting to CFLs and QRs, we feel that true progress stems from the everyday actions of forward-thinking people and organizations. With that in mind, I'm excited to share the museum's green efforts with you in the weeks to come and I'm looking forward to hearing your thoughts about these initiatives. Stay tuned! The first installment to come later this week! The opening reception for THADDEUS MOSLEY: SCULPTURE (STUDIO | HOME) is just around the corner. With a little over a week to go, the show is coming together; Thad has been here working here in the galleries for the past few weeks, and our installation team is putting the finishing touches on a spectacular participatory multi-media element to the exhibition. Here at the MF, we rely heavily on the good word of our supporters to help get the news out to the people. If you'd like to help support the cause, you can RSVP to the FaceBook event for the opening. Also, below are two different sizes of embeddable THADDEUS MOSLEY e-flyers. Feel free to copy and paste the corresponding HTML code onto your blog or other social networking site. Or download one of the images and email it to your contact list. Anything you do is greatly appreciated. Happy e-flyering and I hope to see you at the opening! Jumping for Photography in the Galleries! We're jumping for joy about photography in the galleries! For many years here at the MF, we've enforced a pretty strict "no photography in the galleries" policy. This policy was primarily due to the fact that many of the artworks we show deal with light. It would be a complete bummer to be appreciating Danäe, by James Turrell, only to have the experience ruined by someone behind you shooting the room with a flash. But in the age of cameraphones and 10Mp point-and-click's, having a "No Photography" policy seems to us to be a bit out-of-date. We'll continue to enforce a "no flash" policy in light-based pieces, but the majority of our installations are now open for photography! Naturally, we're all very excited about this change. So excited, in fact, that we're jumping for joy! So what's the use in allowing photography in the galleries without having some cool things to do with the photos? Currently, there are a few ways to share your photos with other MF visitors. The first happens while you're here with us at the museum, via the MF SCREENtxt project, which allows you to send photos & text messages from your mobile phone to a 42" flat-screen TV hanging in the museum lobby. And after you've visited, you can upload your MF photos to Flickr and share them in the Mattress Factory Group Pool. This is a great way to share your MF experience with past and future museum vistors! We're really looking forward to seeing your MF photos! Hi there! My name is Leah and I'm the project archivist here at the Mattress Factory. As my first post here on the MF blog, I'd just like to say hello to all of you out there in the interwebs. Welcome to the archive, or, rather, Notes from the Archive – a regular update on MF archival projects and happenings in my world. The Mattress Factory archives are physically located on the third floor of the museum (near the Yayoi Kusama permanent collection pieces) behind two discrete doors. Inside the archive are many artistic gems including 3D installation remnants, models, artist sketches & correspondance, and limited editions. 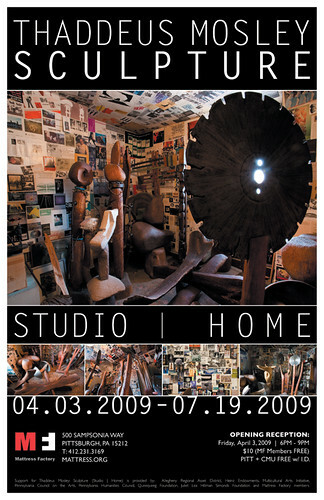 We have many fun + interesting items from past installations. 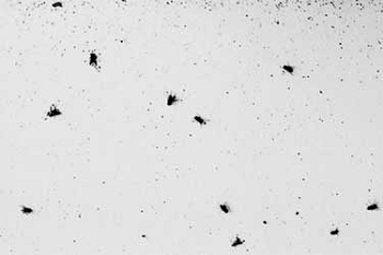 We have the dead fly remains from Damien Hirst’s Bad Environment for White Monochrome Paintings, instructions for John Cage’s Changing Installation at the Mattress Factory, and the wax heads and bird nests from Ann Hamilton’s Offering. While we have a lot of interesting objects from the past, we are always accessioning new items from shows that have just come down. I look forward to sharing my projects with you and keeping you updated on some of the cool stuff I'm working on! Until next time! "Won't You Be My Neighbor?" Day is Tomorrow! Each year on March 20th, thousands of people around the world celebrate the birthday of Mr. Rogers by wearing a sweater and sharing neighborly good deeds. This year is no different! To celebrate the legacy of Pittsburgh's most notable neighbor, we're offering FREE admission all day and hands-on art-making activities in the lobby from 11:00AM - 4:00PM. 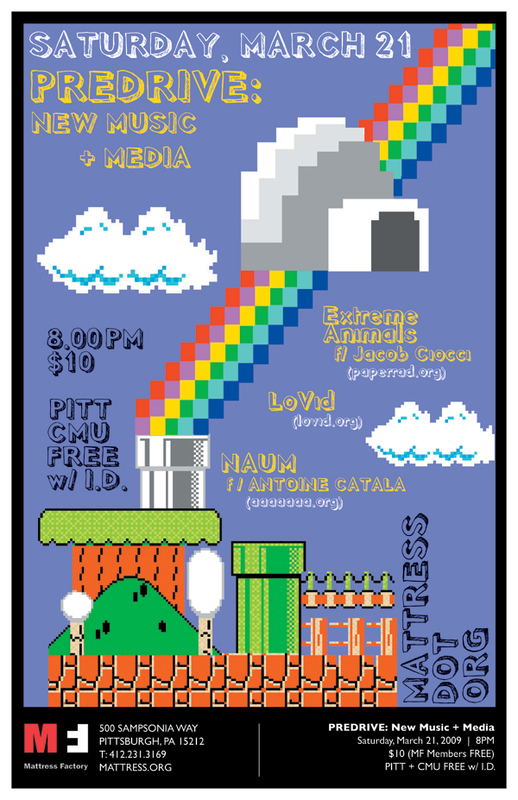 The activity we've planned for tomorrow is called Pixel Pages. It's a great, fun project that explores the colors and concepts of Jacob and Jessica Ciocci’s installation, The Dark Side of Light. Using simple materials like graph paper, transparencies, highlighter markers, and tape, participants make layered and colorful compositions from images in the piece and from geometric forms. The activity simulates the stitching together of pixels to create digital images in a distinctly non-digital way. 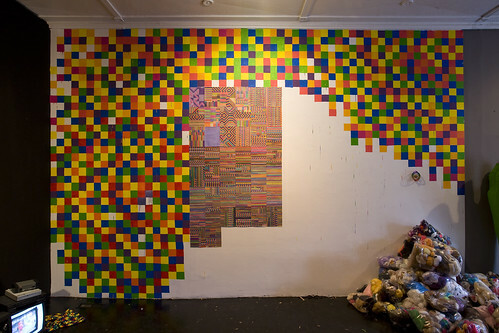 Visitors will also be able to contribute to a collaborative wall mural made of colored paper “pixels” and images. I hope to see you tomorrow! And don't forget to wear a sweater, we'll all be wearing ours! 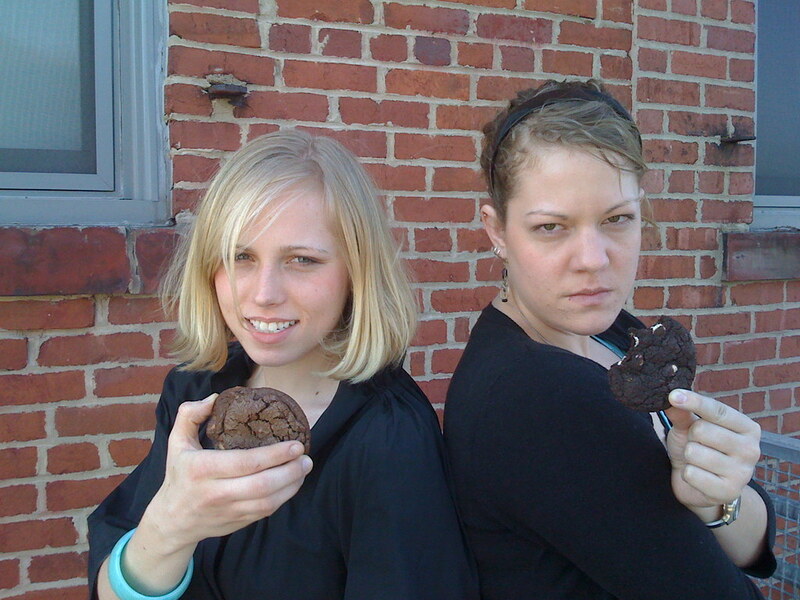 MF Emily (left), MF Colleen (right) and MF Owen (not shown) will face-off in a tie-breaking bake-off to be judged by MF visitors on Friday, March 27, 2009. As many of you who follow our Twitter stream know, we held the first-ever Mattress Factory Bake-Off this morning during our all-staff meeting. There were several very tasty entries (1 2 3 4 + more) and it seems this contest has brought out the previously dormant competitive nature of the MF staff. Silent voting (monitored by MF Lindsay) took place throughout the day by the entire staff. After all the votes were counted, there was a 3-way tie between MF Emily (Development Coordinator), MF Colleen (Development Intern) and MF Owen (Exhibitions Coordinator). Unfortunately, a 3-way tie is not acceptable. So we're going to let the public decide. Next Friday (3/27) Emily, Colleen and Owen will each bake another batch of the cookies they entered in today's competition. Samples will be given out at the admissions desk (* ingredients lists will be provided for people with food allergies) and MF visitors will vote for the cookie they like the best. At 4:00PM the votes will be counted and the winner will be announced here on the MF blog. The winning recipe will be posted here in a future entry. If you like cookies and installation art, next Friday might be a good time for you to stop by the museum. Let's get ready to rumble!! ACUPUNCTURE by Hans Peter Kuhn, Artist Rendering, View from the South. The skyline of Pittsburgh has many visual icons. PPG Place, the Gulf Tower and the Duquesne Incline, to name a few, give the city an instantaneous identity, making it recognizable by visitors and native Pittsburghers alike. But soon, there will be an artistic and innovative addition to Pittsburgh’s cityscape. 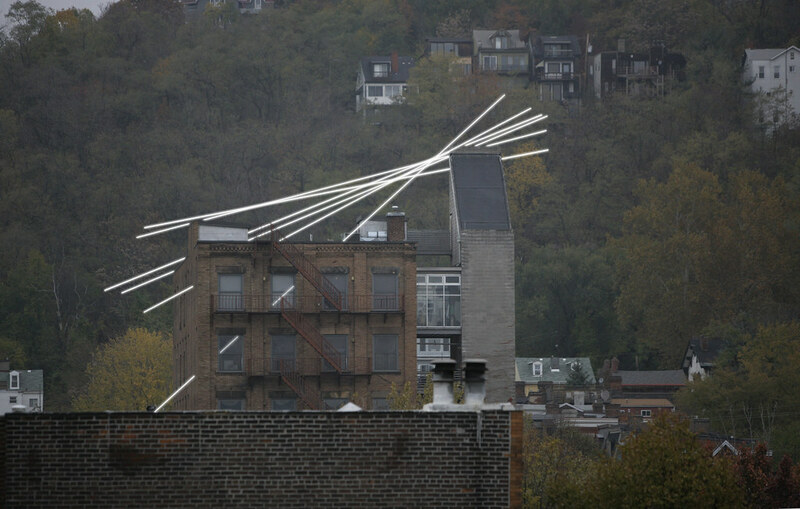 The Mattress Factory has commissioned Berlin-based artist Hans Peter Kuhn to install a lighted sculpture on the roof of its six story building on Pittsburgh’s Northside. The sculpture, titled Acupuncture, will be made utilizing six cold-cathode light bars (averaging 100 feet in length) that seemingly pierce through the building’s exterior walls and roof. The roof-top sculpture is currently in the design and engineering phase. An initial gift from an individual donor has gotten the project off and running, and fundraising efforts continue. Currently, there is no estimated date for completion, but we plan to document the project in every stage right here on the MF Blog. Where art and technology meet come two new social media experiments, pushing the boundaries again of where the Mattress Factory is willing to go. 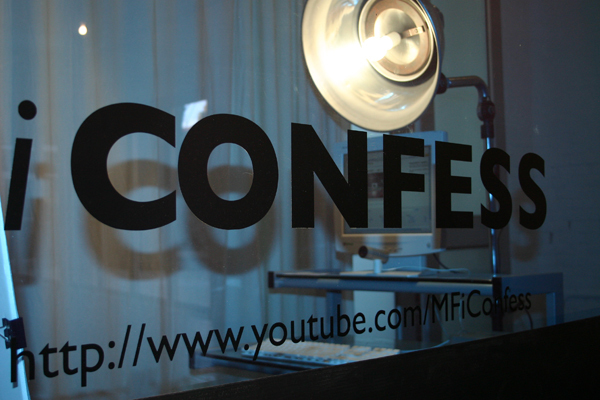 MF iCONFESS and MF SCREENtxt are two unique projects that extend the museum's reach beyond its walls and into the world of social platforms . 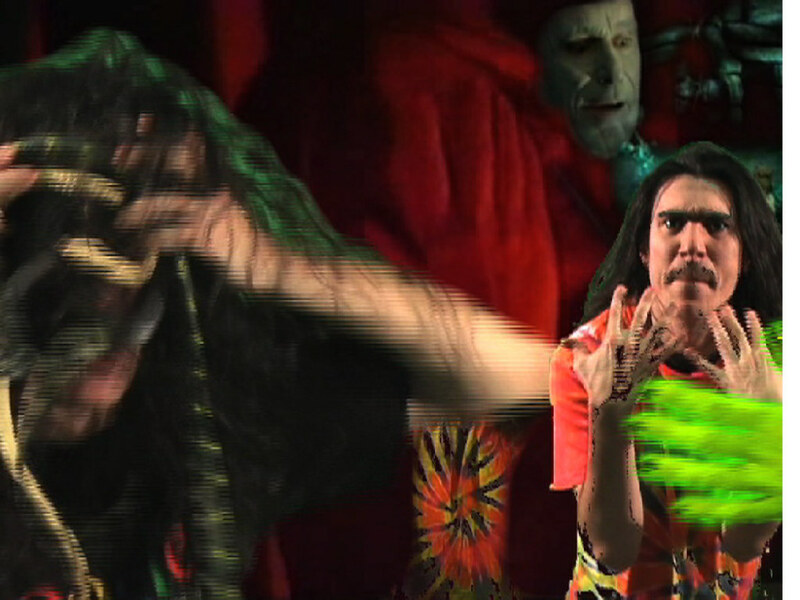 Jacob Ciocci (of Paper Rad) will perform "I Let My Nightmares Go" which uses a video projector and live dance moves to "grapple with mental demons, web 3.0, G.O.D., 21st-century breakdown, real lies and fake truths, cartoon violence, and awareness bracelets." We're always looking for new ways to get to know our FaceBook friends and Twitter tweeps in real life! So that's why we've started THE SHORT LIST, a regularly-occurring meet-up of social media makers here at the Mattress Factory. We held our first meet-up-type event last November in conjunction with the opening reception for PREDRIVE: After Technology. A great time was had by all. Don't belive me? Check out the photos HERE.